Opposition Leader Bharrat Jagdeo on Wednesday accused the Guyana Elections Commission (GECOM) of conspiring with the governing coalition to rig the general elections by replacing the current voters’ list through house-to-house registration. He told a news conference that the PPP would continue to pile pressure on the David Granger-led administration, through peaceful protests and legal action until he calls early general elections. “We will not cease until President Granger respects the constitution and calls early elections,” he said. PPP elections commissioner Sase Gunraj has already noted that house-to-house registration is not a legal requirement. Jagdeo confirmed that he has held talks with a visiting Carter Centre delegation twice and “they have made certain soundings about a proposal”, but he declined to give details about the engagement with that United States-headquartered non-governmental organisation headed by former US President Jimmy Carter. Jagdeo remarked that elections could be held in a short period by extending the validity of the voters’ list, which expires on April 30, for another two months. The Carter Centre’s representatives have also held talks with Attorney General Basil Williams and the Private Sector Commission. 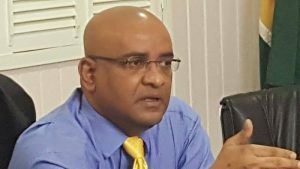 On an alleged plot to rig or delay the elections, Jagdeo claims there were plans not to register at least 10 persons for each polling station in PPP strongholds to ensure that 20,000 persons are unable to vote. Jagdeo claimed he has been told that when concerns are raised, the PPP will be blamed on the grounds that his party has been demanding early general elections. Jagdeo added that plans were also afoot to double-register persons and for GECOM to refuse to do fingerprint scanning to remove duplicate registrants from the list and give foreigners fake birth certificates to allow them to register. “We are not going to accept this. We are not going to roll over and play dead on these issues,” he said. The PPP assured that no government property or public infrastructure would be burnt nor would any harm come to government employees, but plans were afoot to target President David Granger, Prime Minister Moses Nagamootoo and other ministers by making “life very uncomfortable for them.” At the same time, Jagdeo made it clear that there were no plans to harm the president and his ministers. Jagdeo cautioned that based on legal opinions he has acquired, President Granger would lose his presidential immunity from Thursday – when the 90-day period expires following the no-confidence motion – and that he and his ministers would be subject to civil and criminal proceedings for decisions taken and state resources used. “We have made it clear to investors that we will not respect any agreement signed by an illegal government and the government will be illegal and the agreement will be voidable and there could be criminal and civil procedures filed against those people who have colluded and conspired with the government when they were illegal,” he added. On the claim that the government would remain in office out of necessity, the Opposition Leader said there could be no necessity arising out of a process that the President himself has engineered. “The government cannot claim necessity… All the lawyers that I have spoken to claim that the President cannot take advantage of his illegality by blaming necessity because they (the lawyers) are saying to me that necessity cannot be applied when it’s self-inflicted,” he said. A drowning man clutching at straws!! !